Derek is a dollop of daisy. He brought me pink roses just for the heck of it. At first we put them in a normal clear vase (the kind you get from the florist), but they looked awkward. The stems were super long. I almost didn’t cut them down, because I was worried it would hurt Der’s feelings, like he cares. 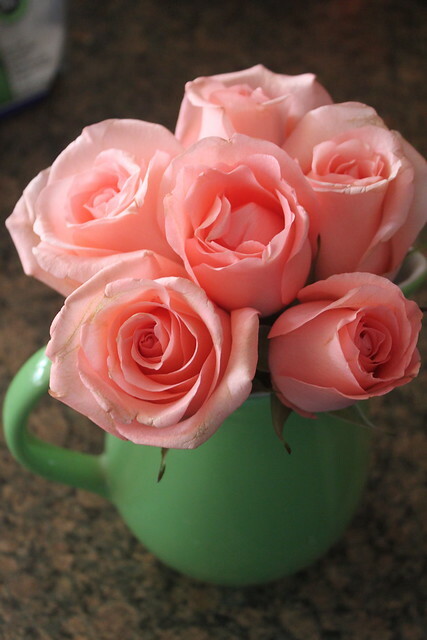 I cut over half of the stems off and put them in the small green pitcher…sooo much nicer. Thanks Der for being an amazing husband! I love you bunches!